Phi Kappa Tau, by admitting me to membership, has conferred upon me a mark of distinction in which I take just pride. I believe in the spirit of brotherhood for which it stands. I shall strive to attain its ideals, and by so doing to bring to it honor and credit. I shall be loyal to my college and my chapter and shall keep strong my ties to them that I may ever retain the spirit of youth. I shall be a good and loyal citizen. I shall try always to discharge the obligation to others which arises from the fact that I am a fraternity man. INTERESTED IN OUR Fall 2017 NEWSLETTER? CLICK HERE! Have a Twitter? Follow @MStatePKT to see our tweets! Have a Facebook? Like the page to stay up to date on the weekly happenings of the chapter! 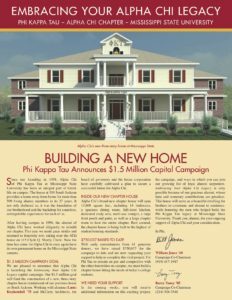 Do you know someone that is a good fit for Phi Tau? Recommend him here! We are happy to announce that we received 28 new associate members for the fall of 2017! Phi Kappa Tau has won the Greek League Intramural Flag Football Championship for the second time in three years!